This morning the UK’s latest GDP figures were released, showing that the UK economy grew by 0.8% in the first quarter of 2014. This is the 5th consecutive period of GDP growth – the longest positive run since the financial crisis. However the Pound fell on the news as the market had been expecting it to be even higher, at 0.9%. 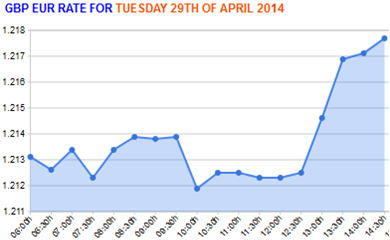 Just before the release rates rose slightly in anticipation of a good result as you can see in the chart above. You can also see the sharp drop the moment the actual number was released. In the currency markets, figures like this are forecast in advance and priced into exchange rates accordingly. After the UK’s figures, GBP/EUR sat around the €1.21 level. At 1pm Germany released its latest inflation numbers. Much like the UK’s release, Germany’s figures were slightly lower than expected, and this caused the Euro to weaken and become cheaper to buy. Germany is the EU’s largest economy so that’s why the results had quite a big impact on Pound/Euro rates, helping them to recover up to €1.2180. If you have a currency requirement, and would like to discuss what might move the exchange rate, then get in touch with me for a free chat. I can discuss what you need to do and talk over what might move the exchange rate. I can also provide you a quote to compare with your bank or existing currency broker – even a small difference in the rate can often save you thousands of Pounds. Click here to get in touch and find out more about the rates I can provide.